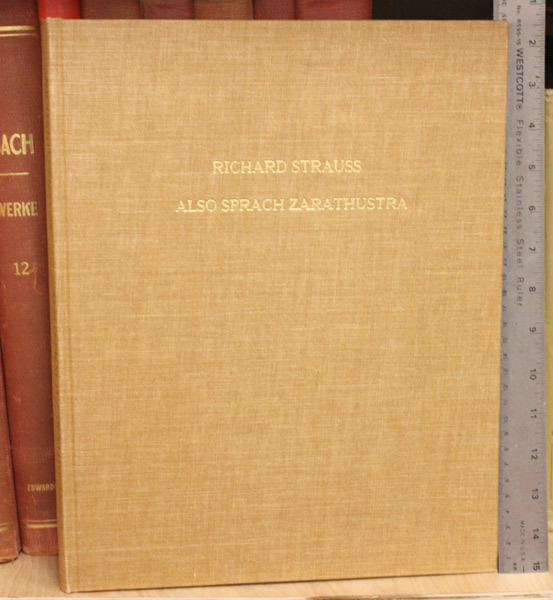 Strauss, Richard, ''Also sprach Zarathustra!'' Tondichtung (frei nach Friedr. Nietzsche) fur grosses Orchester. 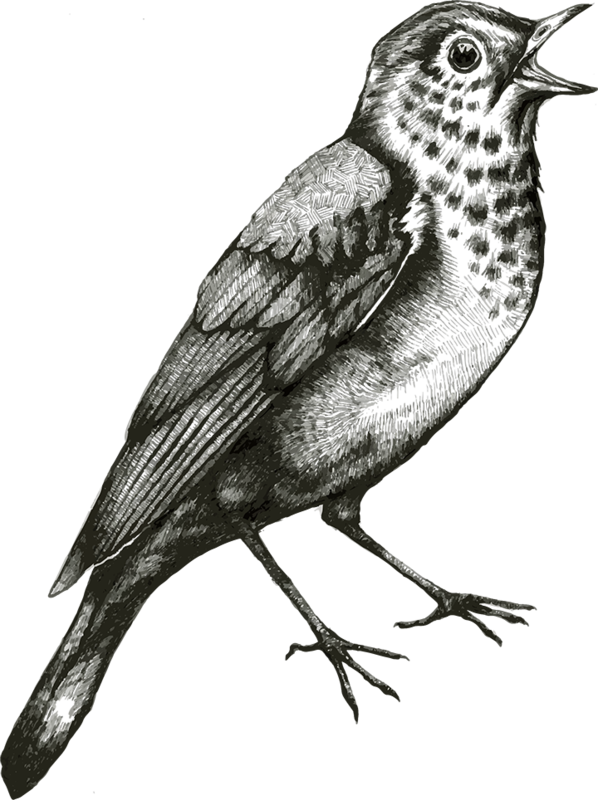 [Thus Spoke Zarathustra, Tone Poem, freely after Friedrich Nietzsche, for large orchestra). Strauss, Richard, ''Also sprach Zarathustra!'' Tondichtung (frei nach Friedr. Nietzsche) fur grosses Orchester. [Thus Spoke Zarathustra, Tone Poem, freely after Friedrich Nietzsche, for large orchestra). 115 pp. Folio, full score, rust colored linen with gilt lettering on front and spine. A reprint of the Aibl edition bearing the Aibl 1896 copyright, the Peters 1931 copyright, a U.E. plate number (1496), and the Peters Edition number Nr. 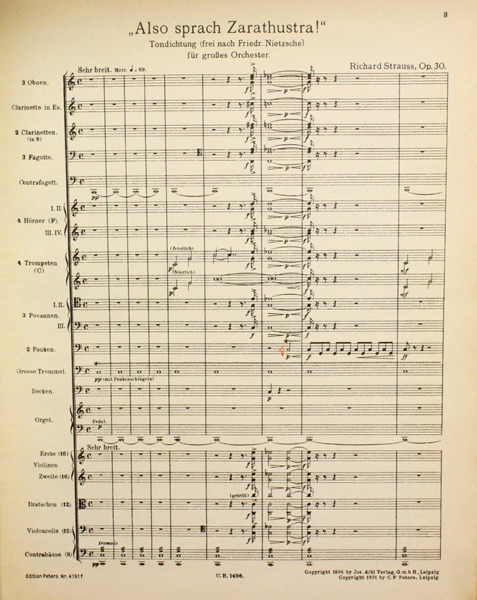 4191f at the bottom of the first page of the score. Linen binding is in fine condition. The pages are somewhat tanned with a few professional marks in pencil and red and blue crayon. Previous owner's stamp on title page. Finished in August 1896. First published in 1896 by Jos. Aibl Verlag. ''Bless the cup that is about to overflow, that the water may flow golden out of it, and carry everywhere the reflection of thy bliss! Lo! This cup is again going to empty itself, and Zarathustra is again going to be a man. Thus began Zarathustra's down-going.'' -- a translation of the end of the prologue as appears printed in German on the verso of the title page.